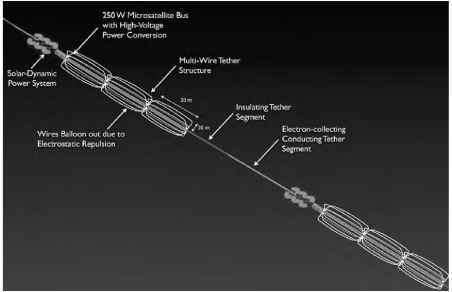 All the tether applications described up to now work only in space. However, the most difficult and costly part of spaceflight is leaving Earth, and that is where the highest potential benefit of replacing conventional rockets with a tether system can be found. In the earlier explanations about how orbits work, satellites were launched with a hypothetical cannon on top of a tower that reaches all the way into space. In reality this would not work, because we are not able to build towers that are several hundred kilometers high. Moreover, the extreme acceleration needed to speed a normal satellite up to orbital velocity over the length of the barrel of a cannon would result into very flat and very damaged spacecraft. Instead, we use rockets to carry satellites above the atmosphere and to relatively slowly increase their velocity. This requires a huge amount of propellant, and in addition large and heavy tanks to contain all that propellant plus all kinds of other rocket engine equipment. Every kilogram of satellite put in low Earth orbit requires about 100 kg of propellant and rocket hardware. This is not very economical, especially because in order to keep the overall rocket weight within reasonable limits there is generally no mass left that could be allocated to wings and heat shields. Without these additions, there is no way to bring the system back to Earth once its cargo has been delivered. Rockets are therefore mostly single-use, expendable systems. This is like using an airplane only once, and buying a new vehicle for each trip—a rather inefficient way of blasting ourselves into space. The Space Shuttle is partly reusable, but the intensive maintenance it requires has led to its being the most expensive launch vehicle. A launch is estimated to cost around half a billion dollars, while a launch with an expendable rocket with comparable payload mass such as the Ariane 5 costs about a third of that. The development of more modern, more economical reusable launch vehicles continues to struggle with mass growth and cost problems, and no revolutionary launch vehicle technology solution is likely to be available in the foreseeable future (see Chapter 2). But what if we just completely dispense with rockets and use something completely different to get into orbit—something like an extremely long tether to climb up into space, for example? This seems to be a rather ludicrous idea, but considerable thinking by various space organizations has already been put into this concept. Even the National Aeronautics and Space Administration (NASA) has studied the "space elevator'' concept and found it to be challenging but not necessarily unfeasible. The general idea involves a cable of an incredibly strong material that directly connects an orbital space station with Earth's surface, kind of like a bridge or beanstalk into space. The center of mass of the system would have to be positioned in geostationary Earth orbit, where its orbital rotation is 24 hours and it thus remains above the same point on the equator as Earth rotates around its axis. In this way, the tether could be connected to an earthbound base station located on a fixed position somewhere on the equator. With the center of mass in any other orbit, the system would move too fast or too slow with respect to Earth's surface, and the cable would break. To have the system's center of mass in geostationary Earth orbit, a countermass would be needed at a higher altitude to compensate for the mass of the cable going down to Earth; because the countermass would be moving too fast for its higher orbit, it would pull on the tether and keep it taut. In other words, the centrifugal force on the part of the cable above the geostationary point would balance the gravity force pulling down the lower part (Fig. 1.17). Figure 1.17: Schematic of a space elevator (not drawn to scale). needed to bring something up the tether into space and early estimates of the fixed operations cost of a space elevator, the cost for bringing cargo into orbit could be less than $150 per kilogram—about a factor 100 lower than is currently the case. A person with luggage could then make a trip into space for only $15,000. If a space station would be put in the elevator system's center of mass, that is, in geostationary Earth orbit, it would be located at an altitude of 36,000 km (22,000 miles). Preliminary estimates suggest that an electromagnetically propelled elevator may take more than a day to reach such an altitude, and a mechanical climber may take more than a week. Elevator shuttles for people would thus have to be equipped with sleeping facilities, a kitchen, toilets, and so on, but for uncrewed spacecraft and cargo containers the long travel time would not matter. The low acceleration levels and the lack of noisy, violently vibrating rocket engines would actually make the transfer much easier on satellites and other equipment, allowing them to be constructed less robustly than required for a rocket launch. This could result in less expensive spacecraft. The orbital station at the geostationary point could be made very large, as construction materials from Earth could be transported up easily and at low cost by the elevators. The station could incorporate satellite launch facilities, telecommunications equipment, astronomical observatories, Earth remote sensing instruments, and space tourist hotels with microgravity sports facilities and rooms with magnificent views of Earth and space. Mass growth of the station would have no effect on the stability of the space elevator, because it is located in the geostationary point. That is where the system's center of mass needs to be, and where all the mass is effectively in orbit and thus does not pull on the cable in any direction. However, any mass growth by the construction of facilities or installation of additional cables below the geostationary point would need to be compensated for by putting additional mass at the upper, countermass end of the cable. Without this, the space elevator would be pulled down by its own weight. Apart from offering an easily accessible microgravity space station at geostationary orbit altitude, and possibly stations below and above this point, the space elevator would greatly facilitate the launching of free-flying satellites. To put a spacecraft in geostationary orbit, it could be transported up the cable with a cargo elevator, and then simply released from the center mass station. It would then immediately have the right velocity to stay in orbit, and require only small amounts of propellant to reach the intended geostationary orbit position (which is fixed with respect to the surface of Earth). When satellites are released above the geostationary point, their velocity will be too high for their altitude. The result will be an elliptical orbit, with the launch altitude being the perigee. Sufficiently high up the elevator, a spacecraft could even move off at interplanetary velocity and be sent on its way toward other planets. We could think of a space elevator as a giant slingshot hurling spacecraft into deep space. The feasibility of the space elevator concept depends mostly on the availability of materials that can withstand the incredible forces on the cable. Steel is too heavy and by far not strong enough. Cables made from revolutionary materials based on so-called nanotubes are required. Carbon nanotubes are tiny cylindrical molecules of carbon, stiff as diamond yet a hundred times stronger than steel at one sixth the weight. Unfortunately, the performance of cables we can currently construct out of carbon nanotubes is not yet up to space elevator standard (see Cable Material in Chapter 7). The space elevator is the most exciting, most inspiring, and potentially most important application of space tethers, but also the most complex and most difficult to develop. Chapter 6 is devoted to this idea.